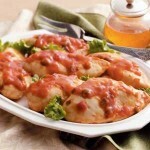 Sour Cream and Salsa Chicken is a slow cooker recipe with taco seasoning. Spray the crackpot with cooking spray. Add the chicken breasts. Sprinkle with Taco Seasoning. 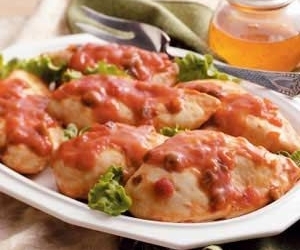 Top with salsa. When ready to serve, remove the chicken from the pot. Place about 2 T cornstarch in a small amount of water. Stir well. Stir the cornstarch mixture into salsa sauce. Stir in ¼ cup of sour cream.